The new play Red is to 20th Century Art what Colonial Williamsburg is to the Revolutionary War: a warm, fuzzy, simulacrum that makes a complex era accessible. Instead of taking audiences inside an 18th Century Southern plantation, John Logan’s one-act play takes them inside the studio of Abstract Expressionist painter Mark Rothko. With less skilled actors, this portrait of Rothko and his fictional assistant would feel only like an ersatz re-creation—something you might see if there was such a thing as SoHo Disneyland. Logan’s play is smart enough to hit all the right historical facts and couch the whole piece as a dialogue about art, but it’s still pretty formulaic. If you were to rub out the names and references, it could probably serve as a biographical play about any artist of the last 100 years. If the intellectual jousting involving the fundamentals of painting, the eccentricities of artistic temperament, and the lasting value of art is vague, at least Logan’s dialogue is sharp and clear. His lines have a rat-a-tat-tat quality that gives Red the sound of a Broadway play. You don’t need to know much about Rothko or other AbEx painters to follow the action, which is probably why the play has been a hit in London and is likely to be so here—it’s certainly more fun than listening to an audio guide at a museum. It’s not much more dramatic, however, then overhearing a heated debate in that same museum’s coffee shop. Logan’s play lacks much conflict and depth, with the characters little more than archetypes: master and apprentice. Luckily Alfred Molina is a larger-than-life performer and he makes Rothko feel as big and complex as one of his rich, maroon canvases. I’ve seen him single-handedly breathe life into dreary productions, and here in Red he props the whole work up. Eddie Redmayne holds his own as the assistant Ken. The British actor sometimes struggles with his American accent, but he delivers all of the lines with a naïve passion that works for the character of the aspiring artist/assistant. If Red were performed in a small theater, it would lose much of its impact. The high ceiling and expansive stage provides a sense of verisimilitude, as does watching Rothko and his assistant hang all of those timeless canvases meant for the Four Seasons (the thin plot involves the artist’s infamous Seagram’s commission). It must be said that the visual elements of the play help fill in the dramatic gaps: the Rothko recreations are all full size and rich in color and the play soars in a speechless scene when Ken and Rothko prime a large canvas in burst of physical exertion. The men attack the canvas with red paint as Gluck blares on the phonograph. It’s just a minute or two out of an hour-and-a-half play, but it’s the one moment in Red where the primal madness and sheer joy of creating a work of art is truly evoked. 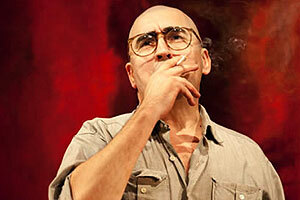 Image: Alfred Molina as Mark Rothko. Photo by Johan Persson.